It is the fag end of beet season here. 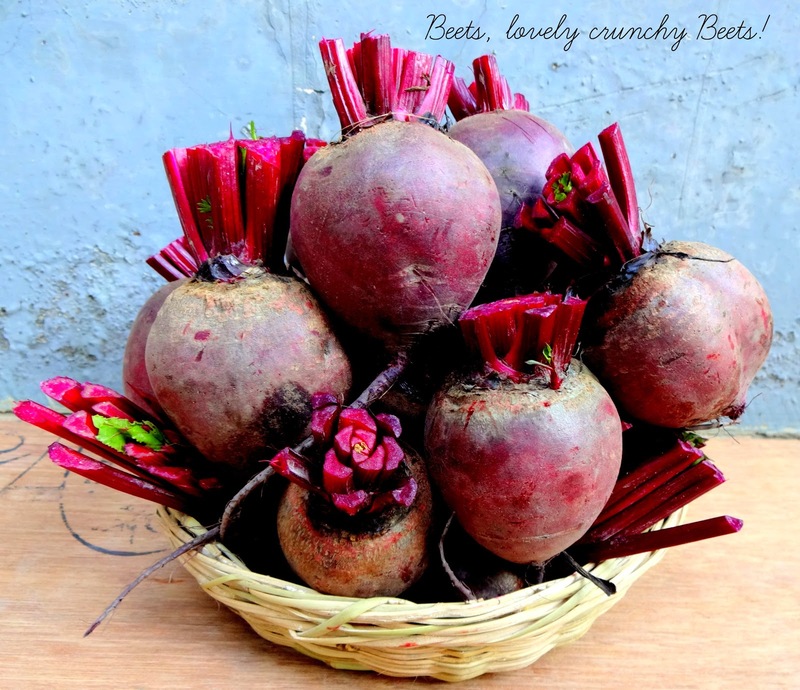 We were lucky to spot some fresh crunchy beets in the market and ended up purchasing the entire lot. My husband got down to making beet wine. Having successfully made beet wine in the first attempt, he wanted to replenish the stock, now with some variations and combinations. I made Vegan Beet Walnut cake. 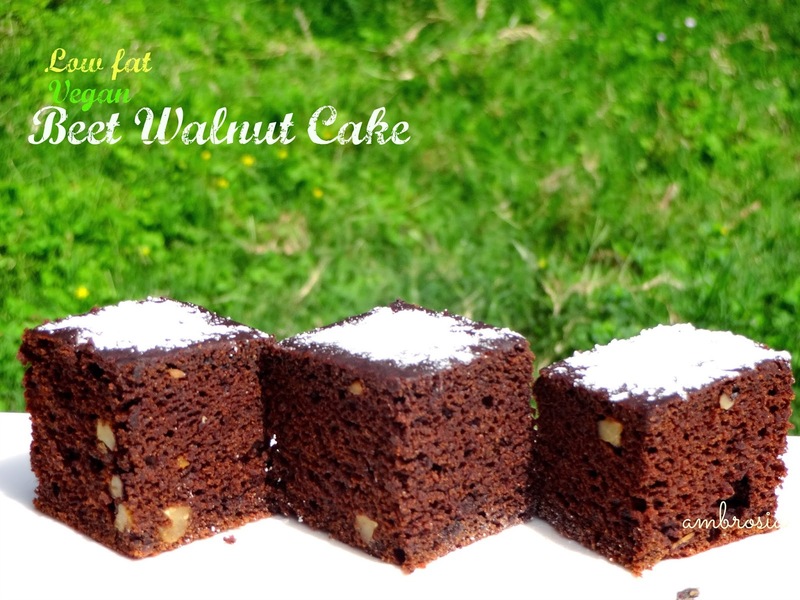 A simple guilt free cake with no butter, no eggs, with whole wheat flour, beets and walnuts, it was simply divine. A recipe that is truly healthy and happy. Moist, fudgy and chocolaty it was relished by kids and grownups alike. I used homemade soy milk. It was a pleasure baking this cake. Preheat oven to 180 degrees C. Line the base of a 7 x 7 inches square cake tin with parchment paper. Grease and dust the sides. Pressure cook the beets till tender. Cool. Peel and puree. Measure half cup and keep aside. Whisk together soy milk and apple cider vinegar. Set aside for a few minutes. It will curdle. This is vegan buttermilk. Add sugar, olive oil, vanilla essence and beet puree. Mix well. 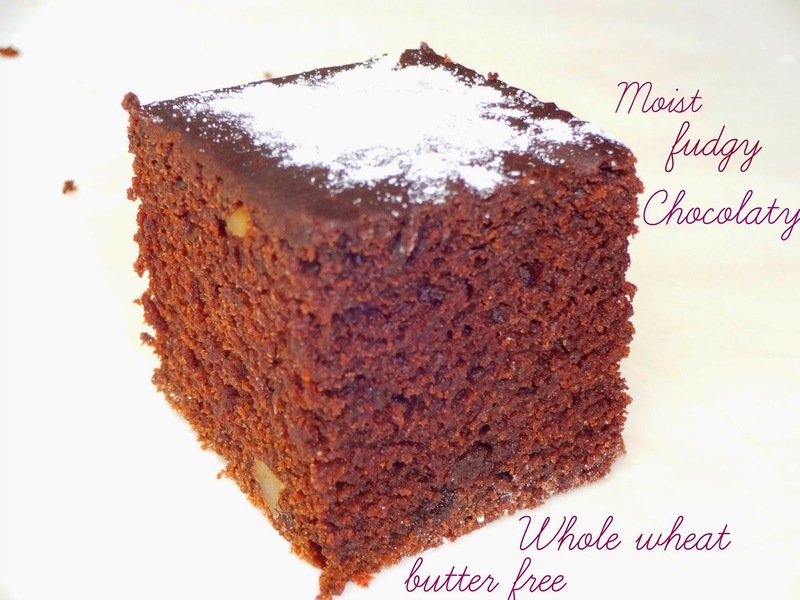 Whisk together whole wheat flour, baking soda, baking powder, cocoa and salt. Add dry ingredients to wet ingredients. Mix gently till the batter becomes smooth and lump free. Do not over mix. Fold in walnuts tossed in a teaspoon of flour. Pour the batter in the prepared pan. Bake for 25 to 30 minutes or till a toothpick inserted in the center comes out clean. Remove from the oven and remove from the pan after 10 minutes. Cool in the rack. Slice next day. Sprinkle confectioner’s sugar before serving. Such a pretty bunch of beets!! they look sooooo fresh! How I wish w get them so fresh here too!! You have put that bunch of beets to good use. The beet wine is catching my interest too...!! And oh, I am a fan of the minimalist baker too... she has some simple lovely recipes there right? Looks awesome! One challenge I see is the oven temperature - mine sets to a max of 230 C. Is there a way around this? Look fwd to your reply - I would really like to try this! Veena, I am so thankful to you for bringing temperature part to my notice. This cake is baked at 180 degrees C. I have made the amendments. Hi Namita, I live in Mumbai and I had to bake this healthful looking cake the moment I got back from work yesterday. They came out very well. I used 12 cup cake pan instead of a single pan, use half measure of demerera sugar and the other half plain castor sugar. How I wish I could show you the picture! Hello, I am so happy that your cake came out well. Don't these healthy recipes give a sense of goodness? Wish I could see your pictures! Thank you for trying my recipe. Hello Namita, can I use almond milk instead of soy milk? Hello Dreams, sure you may use almond milk.I am sure this will enhance the taste too. Pls let me know the outcome. Why do u suggest using soy milk? Can't cow milk be used? Hello Nupur, This is a vegan recipe. Yes, you may use cow's milk. Happy Baking!